Island, they are lifelong players who love to rattle the walls. At stops from Toronto dive bars, industry showcases, to huge festivals in the U.K., the Royal North have been making fans. Together, they command any stage, big or small. If you’re new to a Long Range Hustle show, it only takes a minute to feel how their contagious energy connects with everyone in the room. 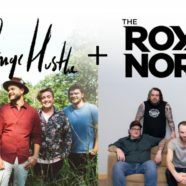 From a sweat soaked club to a breezy festival stage, Long Range Hustle brings the warm infectious melodies, driving rhythms, and gorgeous harmonies, in spades. Their most recent album was recorded at The Bathouse Studio near Kingston, Ontario with acclaimed Scottish producer and mixer, Tony Doogan (Belle & Sebastian, Wintersleep, Snow Patrol) and brings about a refined and evolved sound for the band, reflective of their persistent drive to push themselves.